As outdoor summer Shakespeare rolls out in our local parks, I’m asking the Shakespearean-inspired question: What’s in a name? My answer is, your first confirmation Bible, if the name is Debra Beth Shostak. I have that Bible, and here’s the story behind it. Debra Beth Shostak was confirmed in the spring of 1969 at Congregation Beth Sholom in Park Forest, Ill. I served there that year as an interim executive director, and one of my (admittedly minor) duties was to check the names on the confirmands’ Bibles when they arrived. Debra Beth’s was spelled incorrectly, so back it went for re-embossing. When it was returned, it was too obviously a corrected job, so I rush-ordered a new one and kept the bad one in a desk drawer, just in case. I figured if the replacement was late, I could tell the recipient that on the bima she’d be getting a temporary substitute, soon to be swapped for the real thing. But the arrival was on time, so confirmation went off without any biblical hitch. However, the unthinkable happened that very week: Someone took my own confirmation Bible, which I’d always kept as a reference on my desk. I assumed it had been borrowed, but after days went by with no return, I started using the Debra Beth Shostak reject myself. Out of the drawer it came; up on the desktop it went with my other necessary volumes, and there it remained for the duration of my congregational stay. When my stint ended and I packed up and moved out, it moved with me. I had been confirmed years before, one student in a very small synagogue whose tiny class combined with several other little shuls’ equally small ones for a single big ceremony. Everything bare bones, and all the same: We all wore identical dark robes and received identical black Bibles, none of them inscribed with any name. But by the time Debra Beth Shostak was confirmed, some things had changed: Boys wore the dark robes and got standard-size black Bibles; girls wore white robes and got much smaller Bibles, the white ones they were expected to carry, at some time in the future, along with their bridal bouquets. And all were inscribed with names, in bright gold letters. Today, I have a bookcase with one shelf dedicated to Bibles I often use for reference and for comparison: Several different Protestant ones, the Catholic scriptures, even a Book of Mormon. The little white Bible first intended for Debra Beth Shostak doesn’t live on that shelf, or any other. It sits within easy reach on my bedside table, so I can read a bit from it every night. And because it features that basic Masoretic text, it travels often to my nearby in-home office, so the old black standby is truly that: just a backup for when I need to contrast English translations from any other religious version to a recognizably standard Jewish one. It now does the job that Debra Beth’s badly embossed one did while I waited for her new one to arrive: it’s in reserve for a use that never comes. That was truly a strange year: Parents who had left the congregation years before, after their daughter’s bat mitzvah, threw a major “confirmation” party for her at the same time as her friends in Debra Beth’s class were having theirs — except their girl wasn’t even being confirmed! Like something written much after Shakespeare, “Anything Goes” when you’re Jewish, I guess. I don’t know why I’m thinking of all this 43 years past the fact, but I trust our Bible, which says there’s a right time for everything. Debra Beth probably has a different name than Shostak now, probably children, maybe even grandkids. But she knows nothing about the existence of this much-worn little book, whose gold embossing that reads “The Holy Scriptures” is just as miserable-looking today from much handling as her name was from attempted correction at the start. I recently sat shiva for my father, may he rest in peace, and was reading the laws of mourning. One thing that struck me was the instruction to refrain from wearing leather shoes. It offered no explanation, so I did it just because it says so, but it’s been bothering me ever since. What do leather shoes have to do with mourning? Why are other leather garments such as belts and jackets permitted? The following blessing thanks God for “ordaining the steps of man.” Shoes represent the ability to move forth in the world, to walk along the steps that God has ordained for us to move ahead in our lives and be productive. The previous blessings thanked God for waking us up, giving us the strength to sit up and get out of bed as free individuals who are able to make choices with our lives. We are created in the image of God, giving us the ability to not only carve out our lives, but to make a difference in the world and help perfect it. That is why shoes are considered “all my needs,” because they reflect our ability to walk ahead with full force, unimpeded by the rocks and sharp items on the way. We can step right on those objects and keep moving ahead. Shoes, in rabbinic literature, are always leather. Shoes of leather represent man’s dominion over the universe, as these shoes were created with the skin of the animal. Mankind was endowed with a God-given license to control and utilize animals for our needs after the flood, when Noah saved the animal kingdom in the ark. This brought man’s creation in the “image of God” to a new level, exercising control over all living things. Taking steps ahead — in shoes created by the dominion of man over the world and the animal kingdom — represents the ultimate manifestation of the power of man. In Torah life, there are times to express power and times to emphasize humility. Times of mourning, when we have lost a loved one, is one of the times we shed our power and bow our heads to the ultimate justice of the Almighty. A mourner, as I’m sure you read, recites the blessing “Blessed are You, God, … the True Judge.” This is a time of subjugation of what to us seems true and just to the true justice of the judge who sees things from a very different vantage point. We express the shedding of our own power to that of God by removing our leather shoes. For this reason, we collectively remove our shoes as a nation on Tisha B’av, the day of national mourning over the destruction of the Temples in Jerusalem and all subsequent calamities in our history. In this way we express, as an entire nation, our acceptance of the will of God and His ultimate dominion and judgment. There is also a deeper, Kabbalistic understanding of this law. The Torah says that man was created by God’s breathing the breath of life into his nostrils, (Genesis/Bereishit 2:7). This “breath” (neshima) is called the “neshama,” or soul. The Kabbalah explains that there are various “parts” to the soul. The highest part, the “root” of the soul, resides right at God’s throne in the highest of the transcendental spiritual worlds. The lowest part of the soul resides in our physical bodies, down in the physical world. For this reason, the body is referred to in Kabbalistic literature as a “na’al” or shoe. Just like most of the body resides above ground, and only the lowest part, the feet, reside in the shoes; so too most of the neshama resides above, and just the lowest part resides in its “shoe”: the body. For this reason, when we reach transcendent levels of connection with God, we are commanded to remove our shoes. Moses was told by God to remove his shoes at the burning bush (Exodus/Shemos 3:5). The Kohanim/priests serve God in the Temple without shoes, and all visitors must remove their shoes when they enter the Temple Mount to connect to God. Prophets removed their shoes when speaking to God. All Jews are commanded to remove their shoes on Yom Kippur, when the entire nation is elevated to be like angels connected to God on the highest level, as is outlined in the Code of Jewish Law. All these cases are situations where we transcend our bodies, our “shoes” and rise to higher levels. At the time of death, the soul connects to God in such an intimate way that it can no longer stay in its physical body. For that reason, it leaves the body, shedding its “shoe” completely. The mourners, in order to commemorate that connection the soul of their loved one has attained, sit in a low place without their shoes. This is a reminder that all life comes to an end, but the end is also the beginning of an eternity. I bless you with the traditional blessing: “May you be comforted among the other mourners of Zion and Jerusalem” and may you know many simchas in the future. When I started out this week’s column, I was a little worried. With summer upon us, I had a little extra space to fill, and let’s face it, summers can be a bit slow for our Dallas Doings column (and Around the Town for that matter). I must say, however, I’m loving this week’s column because it is exactly what my hope Dallas Doings can be on a week-to-week basis … a little of this … a little of that and a lot of input from our readers! Right off the bat, I’d like to recognize our own Dave Sorter, managing editor, here at the TJP. You might remember that when I introduced Dave to you back in May, I mentioned that he was an award-winning journalist. Well, our Dave has earned more top honors just this week from the Texas Press Association. Here’s the rundown: In Division 9 (medium-small weeklies) for his work at the Crowley Star last year, he earned first place in news writing, second place in general excellence and third place in three categories, headline writing, editorial writing and sweepstakes. In Division 10 (small weeklies), for the Joshua Star, Dave earned a first place in editorial writing. Kudos to Dave, and I’m making some room on the office mantle for our slew of awards that Dave is sure to earn for the TJP, which incidentally would fall into the medium-large weekly category. We receive many press releases here in the office, mostly by email, some by snail mail. Oftentimes this is a true lesson in Jewish geography, as I don my Sherlock Holmes cap and verify the bona fides of the person or event on tap to see if it “qualifies” for our pages. Recently, I received a notice from the Dallas Chapter of the Texas Chefs Association, naming Idalee Cathcart as its 2012 Pastry Chef of the Year. That prompted a “mazel, mazel” from me. I was thrilled when Idalee dropped by our Belt Line Road office recently and shared some more about herself. She is the owner of L’Dor V’Dor Confections and a graduate of the Culinary Institute of America in Hyde Park, N.Y. She and her husband, Doug, are members of Tiferet Israel and have lived in Texas since 1992. For the past eight years, Idalee has learned Torah weekly with a study partner from Brooklyn, N.Y. “We discuss the weekly parashah, read Hebrew together, and she answers most of my questions of which, being Jewish, I have many.” Idalee can often be seen baking in the Tiferet kitchen as well. Idalee will receive a commemorative plaque at the 2012 State Chefs Association Convention President’s Dinner Aug. 4 in Tyler. Congregation Ohev Shalom’s social hall isn’t new, but it has a new name as of two weeks ago — the Louis and Lane Kent Glazer Social Hall. The Lane Kent Glazer Social Hall was built in 2002 after Glazer’s death. His parents, Louis and LaRue, family and friends attended a memorial service and became better acquainted with the Far North Dallas Orthodox shul and its congregants. After the services, Louis wanted to know what could be done to memorialize his son. When informed the shul needed an expanded social hall, the Glazers enthusiastically agreed. Plans were drawn up, a builder was hired and funds were provided from family and legions of friends. Louis died recently, and the shul decided to rename the social hall to also honor him. 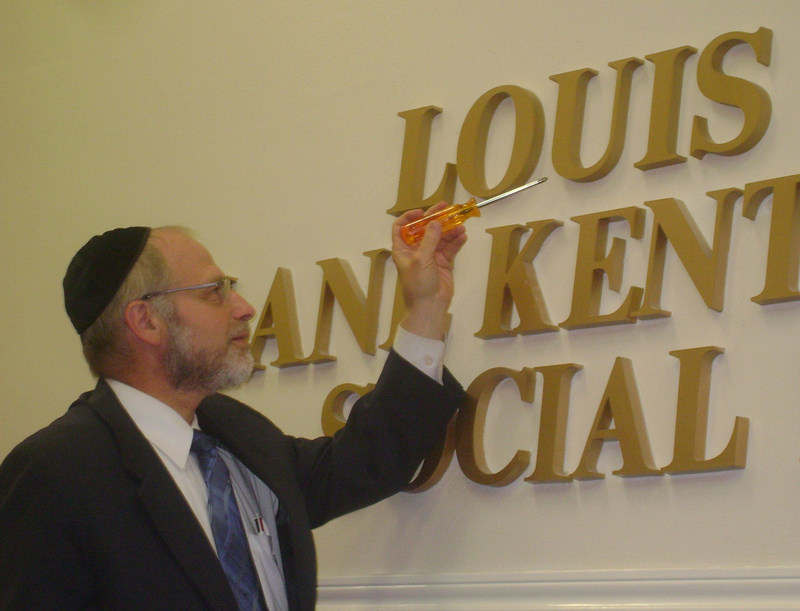 Rabbi Aryeh Rodin symbolically affixed Louis’ name over the entrance at last week’s dedication ceremony. The social hall has allowed the shul to play host to weddings, bar/bat mitzvah celebrations, and other sit-down functions. Over the years it has provided a place for people to come together and share meaningful milestones and significant events with family and friends, Rodin said. Rashi USY, the youth group for high schoolers at Congregation Beth Torah, won the lion’s share of awards at the annual regional convention earlier this month in Houston, while two of its members were elected to leadership positions. 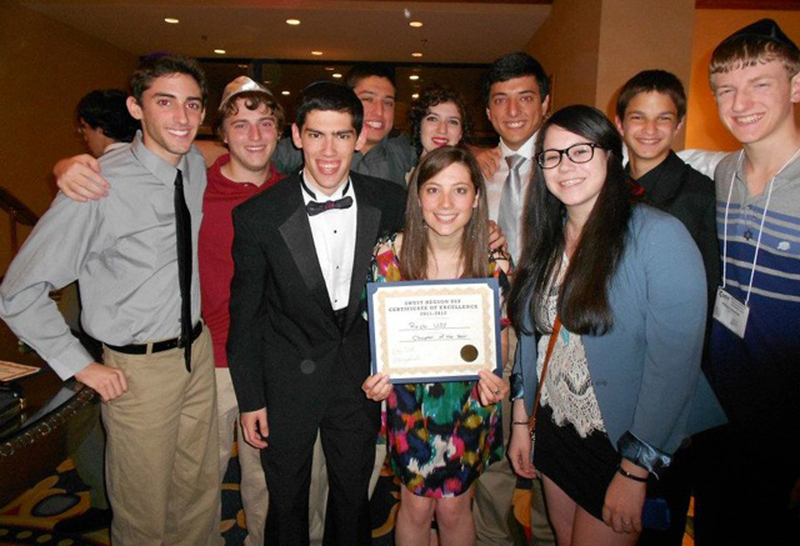 The Beth Torah group was named Chapter of the Year by the Southwest Region of United Synagogue Youth, while Jeremy Duchin was elected the regional president for the 2012-2013 year. His Rashi colleague Freda Coren won the post of regional communications vice president. Social Action Vice President of the Year, Haley Hogan. Programming/Israel Affairs Vice President of the Year, Richard Stayman. Member of the Year, Jeremy Duchin. Two other Dallas-area USY members — Liora Zhrebker of Shearith Israel and Gabby Kasner of Anshai Torah – also were named to the regional executive board. The Southwest Region of USY encompasses Conservative synagogues in Texas, Oklahoma and Louisiana, and Rashi alumnus Maury Jacobs is the regional youth director. Congregation Shearith Israel will kick off some creative Shabbat summer programming this weekend. The “bar” will open following Shabbat morning services at both the main campus (9401 Douglas Ave.) and Beit Aryeh (Ann and Nate Levine Academy, 18011 Hillcrest Rd.). For information, contact Mona Allen, 214-939-7318 or mallen@shearith.org. Other fun Shabbats at Shearith this summer will be on July 21 at Beit Aryeh for Hoop it Up Shabbat, and on Aug. 4 at both locations, Wings and Things Shabbat. Join the Shearith community for worship and a creative way to spend Shabbat morning. DATA’s Rabbi Bentzi Epstein will once again hold his summer class, Spirituality 101, at 7:45 p.m. Wednesdays, July 11 to July 25. And, if you can break away on short notice, there is a challah baking class at 8 p.m. today at Central DATA, 5840 Forest Lane. If you’ve wanted to learn about the mitzvah of challah baking, this class is for you. To RSVP, contact Atara at 443-558-8302 or Aliza at 845-608-2666. Now that’s what I call a fun column! Let me hear from you. Send your news to me at sharonw@texasjewishpost.com or by snail mail. I love to hear from our readers. Tzedek is the mitzvah of doing justice. The words tzedek and tzedakah appear almost 300 times in the Torah. Jewish traditions teach that justice and compassion are two of the most important qualities for people to survive and live together. When Ruth Bader Ginsburg graduated with honors from Columbia Law School, not one law firm in New York would hire her because she was a woman. She became a pioneer in the fight for women’s legal rights and she argued six landmark cases on behalf of women before the Supreme Court. President Bill Clinton nominated her to the Supreme Court in 1993. Upon accepting the nomination, she spoke of her background. Ruth Bader Ginsburg is the first Jewish female justice. However, many great American Jews have served the United States as lawyers and judges. Louis Brandeis was the first Jewish Supreme Court justice from 1916-1939. He was nicknamed “The People’s Attorney” because he was an advocate of social and economic reforms. He was also a leading Zionist, and Brandeis University is named after him. Sometimes kids say that something isn’t fair — something a parent, teacher or coach decides. What does it mean to be fair? Think of some examples and then think of a way to decide what is fair. For example, when sharing a piece of cake, one person gets to cut and the other gets to choose first. Why is it so hard to be a judge? What does it mean to be “impartial”? What would make it difficult to judge someone. Can we judge ourselves? Why or why not? Making sure there is justice in the world is not the same as making sure there are judges. What is justice all about? Some people say that life isn’t always fair — is that fair? Observant Jews in Tarrant County can find it difficult to observe the dietary laws. Though some of the local grocery stores offer kosher food sections, buying fresh kosher meats typically necessitates a trip to Dallas (or, as one person tells us, ordering in bulk twice a year from New York). A recent announcement, courtesy of Congregation Ahavath Sholom’s Rabbi Andrew Bloom, detailed the fact that Trader Joe’s on Hulen Boulevard in Fort Worth is stepping into the breach to supply fresh kosher meats (as well as an expanded kosher food section). Rabbi Dov Mandel with Chabad of Fort Worth said this is well within how Trader Joe’s operates — this is a chain that is nationally known for carrying kosher foods. In keeping in the spirit of that announcement, look for an upcoming article about Trader Joe’s commitment to kashruth (as well as what some of the other grocery stores are doing to meet this need). Alex and Sophia Nason’s son Robby Nason recently completed his ears, nose and throat residency at Washington University’s Barnes-Jewish Hospital in St. Louis. During his residency, Robby spent two years in research and five years in the head-and-neck program. The next stop is a one-year fellowship at Children’s Hospital in San Diego, where he’ll specialize in pediatric head and neck surgery, after which he plans to settle in Texas with his wife, Diane, and 2-year-old daughter, Natalia. 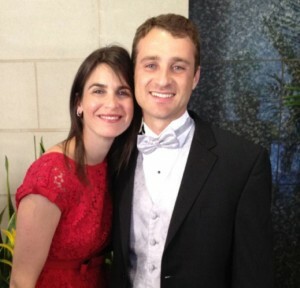 Robby’s seven-year residency followed graduation from University of Texas Medical Branch in Galveston and receipt of his undergraduate degree from Rice University in Houston. Elise Granek, daughter of Gail Aronoff Granek and Harold Granek, just received tenure at Portland State University in Portland, Ore. Elise is assistant professor of environmental science at PSU’s School of the Environment and is also a marine ecologist and conservation biologist. Her research also examines scientific issues and questions pertaining to “effective design and implementation of protected areas,” as well as policies to help protect and conserve both the marine community and ecosystems. Elise’s byline appears on a great number of scientific journals and publications. The tenure is well earned and Gail and Harold have every reason to be proud of their daughter’s accomplishments. … go to Rosalie Schwartz, who turned 86 on June 4. Many happy returns, Rosalie, and may the next year be filled with happiness and nachas. Actually, the show troupe “Kids who Care” will present a selection from its currently touring musical entitled “Choices: Be the Change” at noon, Wednesday, July 11, at Beth-El Congregation, 4900 Briarhaven Rd. in Fort Worth. The presentation will include the Kids who Care delegation from Israel. Cost is $9 for lunch or $4 for just the program. For information and to make a reservation, contact Barbara Rubin 817-927-2736 or Hugh Lamensdorf 817-738-1428. You can also reserve a place by logging onto www.bethelfw.org. The Colleyville synagogue is teaming up with Carter Blood Care for a blood drive to take place from 9 a.m.-3 p.m. Sunday, July 22, at 6100 Pleasant Run Rd. Those giving blood will receive something pretty cool — a gift certificate for a free pint of Blue Bell ice cream — and will be entered to win other prizes, such as Texas Rangers seats or a bed-and-breakfast getaway. Though walk-ins are happily welcome, it’s suggested that those interested make an appointment. For information, call 817-581-5500 or email administration@congregationbethisrael.org. Keep us informed (and send pictures). My email address hasn’t changed: awsorter@yahoo.com. I also want to extend a special “thank you” to those who supplied us with news for this column. The life of the Jewish Federation of Greater Dallas is pretty good today, its leaders and top honorees said during the organization’s annual meeting last Thursday night. The federation’s annual campaign was successful, having met its goal by raising $9.7 million. The number of donors increased for the first time since 2004, with 5,235 benefactors, including 1,097 new ones. The four award winners are examples of volunteer commitment and follow-through, and federation officials believe they are on a path to do even more good works, they said. Board chair Jeff Rasansky, who started his second year as chair at the meeting, echoed the thought and added the federation isn’t all about money. The heart is what has driven the winners of the federation’s four awards presented last Thursday. Shirley Strauss received the campaigner of the year honor. Susan Levy won the Helen Gross Leadership Award. Lindsay Feldman took home the Bess Nathan Young Leadership award, and David Greenstone won the I. Zesmer Young Leadership Award. Greenstone said he believes giving back is a responsibility. “It’s our job to take care of one another,” said the lifelong Dallasite. “My family has always believed that.” In his acceptance speech, Greenstone said the federation family has taken care of him during his tough year. 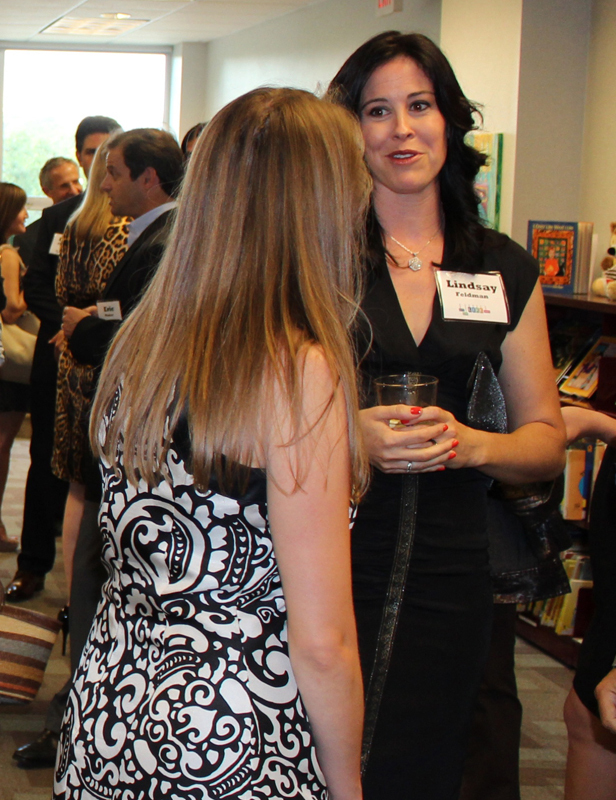 Lindsay Feldman celebrates with a friend before accepting the Jewish Federation of Greater Dallas’ Bess Nathan Young Leadership Award last Thursday. Levy, who accepted her award on her 48th wedding anniversary, has been involved with the federation for many years, and her late mother, Bernice Polins, was a previous recipient of the Helen Gross Leadership Award. Strauss, another longtime federation volunteer, was cited for her dedication and determination in attracting donations for the annual campaign. Kramer also cited songwriter Joel Alhadef, who co-wrote a song “How’s Your Life Today” with Ricky DeVincent that was sung at the men’s and women’s events and played at last week’s meeting. Co-chairs of the meeting were Roxy and Brett Diamond, and Suellen and A.J. Rosmarin. Most Jews are familiar with Tisha b’Av, better known as Av 9, during which unfortunate catastrophes befell the Jewish people (not the least of which was the destruction of both Temples in Jerusalem; the final one taking place in 69 CE). But one thing that’s interesting in observance of Av 9 is that there is a three-week period of mourning beginning on Tammuz 17, leading up to what Chabad.org dubs as “the destruction of the Holy Temple and our launch into a still-ongoing exile.” The ninth of Av, in fact, is the conclusion of this 21-day period of mourning. On the secular calendar, this period begins at dawn Sunday, July 8 (technically Tammuz 18, because Tammuz 17 occurs on Shabbat this year). The more observant will spend this time fasting, mourning and putting more emphasis on Torah study and prayer. Also, in reviewing some of the requirements set forth by Chabad.org, it’s forbidden to try anything new — it’s not appropriate even to recite the Shecheyanu. Lest anyone out there think that this period of mourning is solely doom and gloom, it’s not. “A sense of purification accompanies the fasting, a promise of redemption pervades the mourning and a current of joy underlies the sadness,” notes Chabad.org. This is the terrific aspect of Judaism; there is a specific time to mourn. Then, when that mourning is finished, it’s time to move on. Though we mourn the destruction of the two Temples, not too long after that, begins Elul — and in Elul, we begin preparations for the New Year, the Days of Awe and Yom Kippur. There’s a time to grieve for the destruction of all that is dear to Jews. Yet within two months of that grief, we have the opportunity to celebrate once again. Congregation Beth Israel in Colleyville is teaming up with Carter Blood Care for a blood drive to take place from 9 a.m.-3 p.m. Sunday, July 22 at the synagogue, 6100 Pleasant Run Rd. If you participate, you’ll get more than the great feeling of helping someone else — you’ll receive a gift certificate for a free pint of Blue Bell ice cream and will be entered to win other prizes such as Texas Rangers tickets or a bed-and-breakfast getaway in Brenham, Texas (home of the afore-mentioned Blue Bell). Though walk-ins are happily welcome, it’s suggested that those interested make an appointment. For information, call 817-581-5500 or send an email to administration@congregationbethisrael.org. My apologies if I left anyone out (please let me know if I did so). Looking for a place for the kiddos? Chabad of Arlington is preparing for its third year of Camp Gan Israel, a day camp geared toward Jewish children ages 5-12. There is also a Mini Gan component (for those ages 18 months-4 years). The purpose of Camp “Gan Izzy” is to treat children to a wide array of trips, activities and educational programs, all of which tie in nicely to Jewish themes. The camp runs June 25-July 13, or you can choose to attend for one or two weeks. Times for the older division are from 9 a.m. to 3 p.m. and for the mini campers, between 9 a.m. and 1 p.m. Extended care is available before and after camp, but you need to make arrangements in advance. Questions? Interested in registering? Contact the good folks at Chabad of Arlington at 817-451-1171, email info@arlingtonchabad.com or log on to www.arlingtonchabad.org/templates/articlecco_cdo/aid/1767552/jewish/Dates-Rates-2012.htm. Ometz Lev, the mitzvah of courage, literally means “dedication of the heart.” When our heart is set, we have the inner strength to overcome fear and doubt. This is not only the soldier kind of courage, but also the courage we have because we have trust in God. It also means the power to have endurance, persistence and the strength to be a good person. Hannah Senesh was born in 1921 in Budapest, Hungary. As a teenager, Hannah was very active in Zionist activity and in 1939, she moved to a kibbutz in Palestine. World War II broke out, and Hannah was very worried about friends and family. In 1943, she joined the Palmach, the Jewish army in Palestine. The Palmach planned a raid to help Jews escape from the Nazis. They would drop soldiers behind enemy lines. Hannah volunteered and was the only woman chosen to go on the raid. Soon after landing, she was captured and tortured to give out plans and codes. Hannah refused to speak and was executed by a firing squad. Word of Hannah’s bravery and strength spread to all the Jews. She remains in the hearts of all Jews and is remembered through her poetry for her bravery. “I wounded another not knowing both ends of an arrow mar. The famous Arch of Titus in Rome shows Romans in 70 C.E. triumphantly parading spoils from the Holy Temple in Jerusalem, which they had just destroyed. It is one end of the story of the time the Romans conquered Israel. The small Yavneh academy became the spiritual center of the Jewish people, and a new type of Judaism survived, which allowed Judaism to flourish wherever the Jews would go. The information for this summer’s weekly themes comes from “Jewish Heroes Jewish Values — Living Mitzvot in Today’s World” by Barry L. Schwartz published by Behrman House, Inc. in 1996. Let each family member talk about a time they did something that took courage. Remember, it doesn’t always have to mean physical courage. Does having courage mean you are never afraid? When we talk about strength, we usually think of physical strength. What does it mean to be strong in other ways? Some people talk about “strong families.” What makes a strong family? How can you make your family stronger? Does being part of the Jewish religion or community help make you stronger? How and why? More than once I have come across Orthodox Jews who I felt looked down upon me for not being observant like them and don’t respect us as Jews. I got the impression I am not a good person in their eyes because I don’t keep the rituals like they do. Do you feel they have the right to be that judgmental? Unfortunately, I cannot deny that there are Jews who consider themselves Orthodox who are judgmental of others who live a less observant lifestyle. Their judgment, however, does not have a source in Judaism, and is, rather, reflective of their own personal shortcomings. Judaism teaches that only God has the right and the ability to judge others. (This is to the exclusion, of course, of the judgment conducted in a court of law). There once was a very young man who became the Rebbe of a sect of Chassidim when his father died an untimely death. The elders approached him and asked how it is possible that such a young man could be the leader of those much older than himself? The point of the story is twofold: It is true that some were born into higher levels of scholarship and piety, and therefore may automatically be born into a position of leadership. However, it’s clear that the ones who climbed the mountain to get to where the others were born are much higher in the eyes of God. They achieved it through their own efforts and toil, rather than having it handed to them on a silver platter. The truth is that there’s another aspect of that parable: The place where that boy was born is where he needs to begin his climb. It is possible that one mitzvah performed by a Jew brought up in a secular home is worth 100 mitzvot performed by one who was born into observance. There is no way for mortal man to judge another and to know who is considered more dear or valuable in the eyes of God, no matter what his or her actions seem to be to others. The true Torah philosophy of life is to respect every Jew for who they are and to leave judgment to the Almighty. Condescending attitudes, though they have no source in Torah, are certainly not unique to Jews or any particular sect of Jews. You can find the same attitudes, at times, with Conservative to Reform or Reform to secular Jews as well. It comes from a human desire to “be right.” Often you can find the same attitudes from Republicans to Democrats and vice versa. If you happened to walk by the baseball field at the JFK Learning Center on Henderson Avenue in East Dallas weekdays from June 4-15, you would have seen boys and girls, ages 7-11, learning to bat, catch and throw. If you really stopped and watched, however, you would have quickly learned that what was going on at the Dave Andres Baseball Field was much more than simple catch-and-throw exercises. 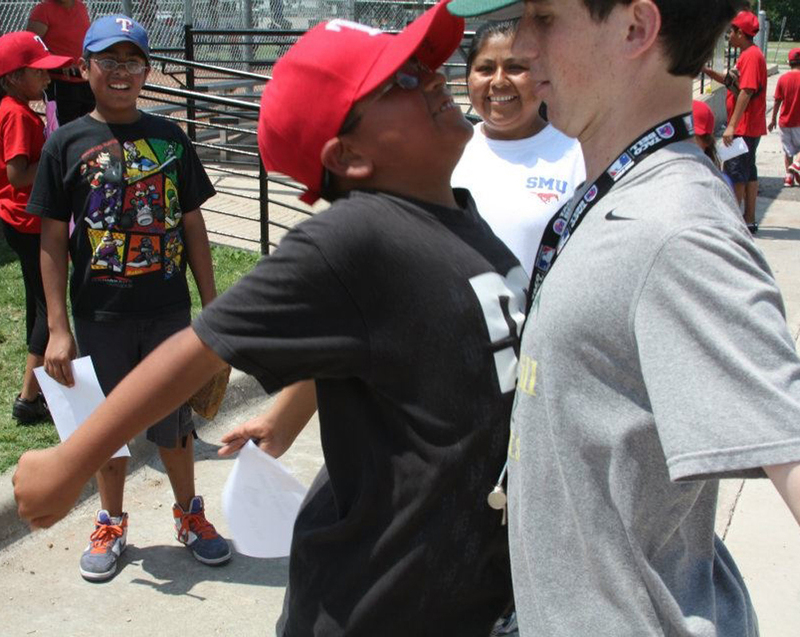 RBI (Reviving Baseball in Inner Cities) Camp is a free baseball summer camp for Dallas ISD students. Started four years ago by recent Greenhill School graduate Louis Andres — son of Marc and Debbie Andres, and grandson of the baseball field’s namesake — RBI is now run by Louis’ younger brother, Miles, a rising junior at Greenhill. Greenhill varsity and junior varsity baseball players coach RBI campers. The camp is supported by donations from the Texas Rangers and the Major League Baseball’s Junior RBI program. The Andres family had a longtime connection with the area through its real-estate and development business. 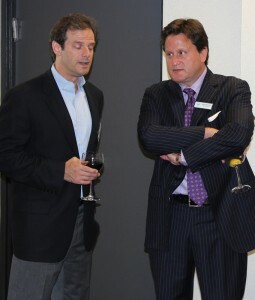 Paul Stanley, a 2009 Greenhill graduate and friend of the Andres family, led the fundraising effort for the field under the mentorship of Marc Andres. They requested it be named for Marc’s father. When Louis first came up with the idea for RBI Camp four years ago, he decided to conduct a one-day clinic to measure the interest in a baseball camp. Coming from a baseball family, Louis and Miles wanted to share their love of baseball with those who didn’t receive the same personalized attention to baseball skills as they did growing up. Because of the family connection, choosing to start a baseball-specific camp was a no-brainer, Louis explained. Miles Andres, right, and a camper demonstrate a chest bump on the last day of RBI Camp. Miles and his brother, Louis, enjoy their time working with the youngsters during camp sessions at the JFK Learning Center in East Dallas. RBI’s popularity has grown so much since its first year that Louis and Miles added a second session this year, having had 50 campers sign up in the first 48 hours of registration. Not only are new kids coming to camp, but also the camp is full of returning kids and their siblings. “We have a kid who has come since he was 7 and now he is 11. Seeing him grow, we don’t want to stop that for any other kid,” Miles said. Besides learning baseball skills, campers create bonds with their coaches. Take, for example, the fact that no kid goes by his or her actual name. Every kid gets a nickname at the beginning of camp. “It started the first year when a bunch of kids wanted different names on their nametags,” Miles said. “Louis and I thought it was a great way for us to get close with the campers. We give them a nickname or we ask them what they want their nickname to be. We have fun with them, and they call each other by their nicknames, too. ‘Downtown,’ ‘Bam Bam,’ ‘Yoshi,’ ‘Champ,’ ‘Lizard Man’ and ‘Sweetie Lou,’ the nicknames are much more engraved in my mind than the actual names of the campers,” Miles said. With Louis heading to the University of Texas at Austin this fall, and Miles quickly approaching his senior year at Greenhill, the Andres brothers are beginning to think about the future of RBI Camp. They hope younger Hornets baseball players in their sister, Elise’s, eighth-grade class will eventually take on the camp. 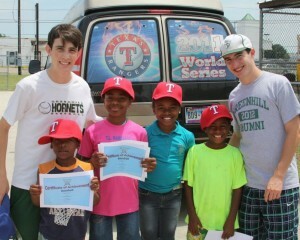 To learn more about RBI Camp visit www.rbicamp.com.